McDonald’s in France decided to have a little fun with its direct competitor Burger King® by building an intriguing temporary billboard. 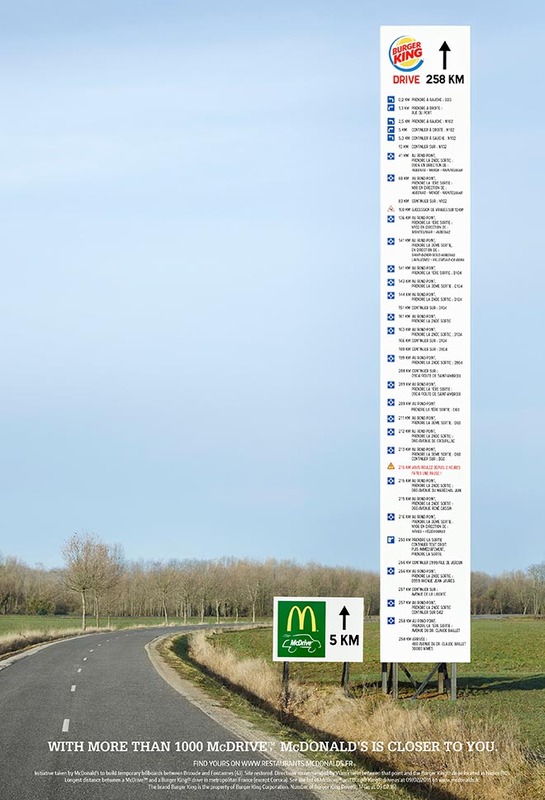 The McDrive vs Burger King installation, near Brioude, a town of 6,700 inhabitants in the Haute-Loire region, involves two temporary billboards, one of them displaying 258km directions, nearly a 5-hour car ride! 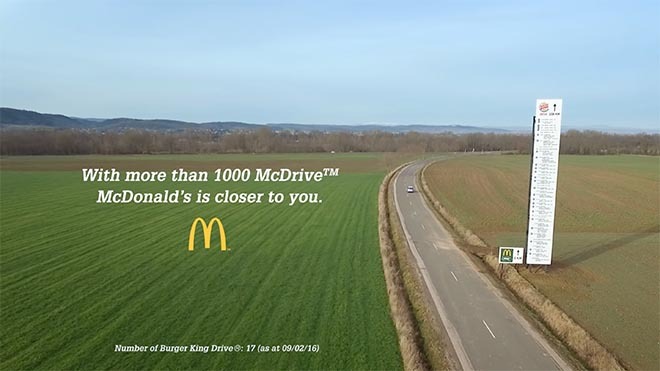 With more than 1000 McDrives™ owned by McDonald’s throughout metropolitan France (except Corsica), compared to less than 20 Burger King® drives, McDonald’s has turned its customer proximity into a major asset. The Directional Billboard campaign was developed at TBWA\PARIS by executive creative directors Benjamin Marchal and Faustin Claverie, art Director Philippe Taroux, copywriter Benoît Leroux, general manager Luc Bourgery, account director Matthew Pressmar, account executive Gaël D’Oliveira, working with McDonalds France chief marketing officer Xavier Royaux, trade marketing director José Jacinto and trade marketing manager Bérangère Dubuc. Filming was shot by director Olivier Corre via TBWA\Else, with producers Maxime Boiron and Jennifer Bauche, production designer Eddy Penot and photographer Yoann Stoeckel.